Cecil Hotel: Horrifying Real Connections to the Stay On Main Tragedy, ‘Dark Water’ and Stephen King’s ‘1408’? First, full disclosure: I never got around to checking out Hideo Nakata’s original Dark Water. I did however see the American remake which hit theaters just a few years after its Japanese source was released. I wasn’t crazy about Dark Water, but it did have some interesting visuals and a seriously heart breaking finale. But what if I told you that Dark Water is extremely similar to the terrible Stay On Main tragedy of 2013, an occurrence eight years distanced from the release of the film. Not insane, by any stretch, but a lot of the parallels between this tragedy and this film, are no doubt eerie. In Dark Water Dahlia and her daughter, Cecilia move into an apartment complex with all sorts of ugliness buried within the sheet rock. It’s not the most lavish of apartments to rent, and visibly, director Walter Salles does a stellar job of creating an unsettling atmosphere with stretched shots, low lighting and tons of shadows. It’s an unsettling place to live. But things get worse in the complex, and before we know it Dahlia is experiencing strange occurrences, but the most paralyzing of those occurrences is the “imaginary friend” Natasha, that finds a fondness in her daughter, Cecilia. As the film progresses the frustration of living in a building that offers no comfort mounts, but so does a mystery that Dahlia couldn’t have foreseen in two lifetimes. The connection between her daughter and Natasha is wrong… all wrong. So, naturally she begins investigating. What she ultimately finds makes the belly truly sink: the climax reveals that Natasha drown in a water tower, no one to hear her scream, no one to answer desperate pleas. For all the flaws that Dark Water suffers from, it gets a few things exceptionally right, like the reveal and the familial tensions. That damn building is a chiller itself, as well! The Stay On Main Tragedy will likely never be solved with any measure of certainty. In 2013 video footage was captured of Elisa Lam in an elevator. Her behavior was erratic. She struggled to remain still, and even more haunting is the fact that, in the video, it sure does appear as though she’s interacting (and at one point hiding) with someone. The problem is, there’s no one else in the video. Whatever was troubling Lam, it was beyond our comprehension. But Lam’s awkward behavior is really just the tip of the iceberg here. After we see the final moments of Lam struggling with some form of unseen menace, she went missing. Gone, no one with so much as a clue as to where she may have gone. But this is where things become even stranger than one could expect. As was the case with Dark Water, Lam’s body was eventually found in the building’s water tower, where she’d been decomposing for quite some time. Visitors of the hotel began complaining of strange tasting water, and they soon learned why. What happened to Elisa Lam during her time at the Stay On Main (I don’t know if I cleared this up yet, but if not, the Stay On Main was formerly titled The Cecil Hotel) Hotel is a true mystery, but whatever it was, it seemed to trigger something very dark, either within Lam, or within whatever else lived inside the Stay On Main. Now we’re going to examine the common activities and shared horrors between the Hotel Cecil and King’s picture, 1408. Now according to King, his story is based on inspiration conjured up by the Hotel Del Coronado in Coronado, California. It’s certainly possible that King’s declaration is 110-percent true (why lie? ), but it’s impossible to ignore the fact the Hotel Cecil had a ton of documented occurrences of violence, death and other depravities that seem to, in some instances mirror the terrors of 1408. So, let’s get back into the darker side of Hotel Cecil, and just look at some of the shocks that 1408 looked clearly inspired by. In fact, we can start with Elizabeth “Black Dahlia” Short, who made one final stop before she was murdered. That stop was at the Hotel Cecil. The Hotel Cecil was, as it turned out, a hotbed for death; In 1931, 46 year-old Manhattan Beach resident W.K Norton was found in his room after committing suicide. This, according to the history books, is the first documented suicide in the hotel. Less than a year later the hotel would again be a place of expiration, as Benjamin Dodich, just 25, died from a self-inflicted gunshot wound. He was found in his room. In 1934, 53 year-old former Army Medical Corps sergeant, Louis D. Borden sat in his room and proceeded to slash his throat with a razor. Grace E. Magro fell from a ninth story window in 1937. She flatlined in a hospital minutes after taking the horrible fall. The following year 35-year old, Roy Thompson, a marine fireman, committed a suicide leap from the top floor of the hotel. Believe it or not, these occurrences have been such common fare at the hotel that I could list another 15 incidents, many of which bore striking similarities to the tormenting visions that stole all sanity from John Cusack’s 1408 character, Mike Enslin. Whether there’s any form of tie between these two films, Stay On Main Tragedy, and the lengthy list of other tragedies that occurred in the Hotel Cecil, it’s very hard to consider all of these harrowing accidents pure coincidence. That’s just stretching things a bit too far for my taste! 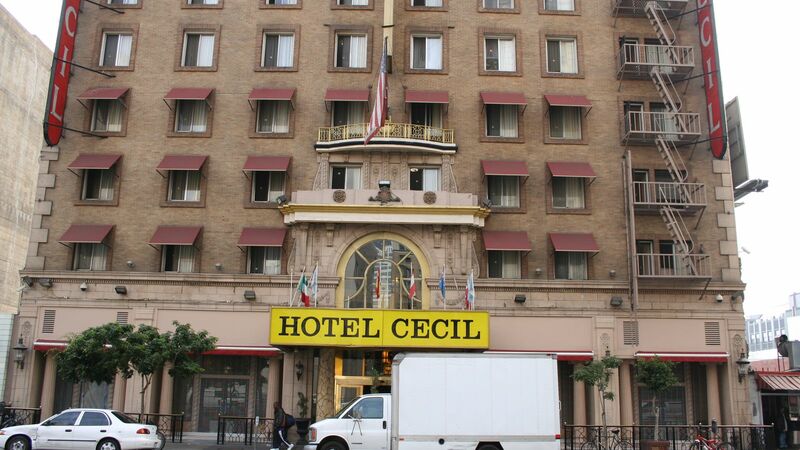 1 Comment on Cecil Hotel: Horrifying Real Connections to the Stay On Main Tragedy, ‘Dark Water’ and Stephen King’s ‘1408’?